Nov. 3, 2009 -- It looked like a time machine had transported Homecoming participants back to the 1920s at Arka nsas State University in Jonesboro, Arkansas, on Saturday, Oct. 24. A lengthy parade of Model T's and other antique cars proceeded to the Cooper Alumni Center, where they rallied in front of the building as part of the university's Centennial Homecoming. About 30 Model T and other antique car enthusiasts from around the region drove their vehicles to participate. A historic re-enactment of an iconic photo in the 1959 A-State yearbook was held using the actual car and many of the ladies who were originally photographed 50 years ago. ASU alumnus Ken Swan of Selmer, Tenn., drove the very same car which was photographed with Phi Mu sorority pledges for the 1959 yearbook. This special event in honor of ASU's Centennial celebration also noted last year 's 100th birthday of the Model T Ford, the car which revolutionized American society and forever changed transportation world-wide. Ken Swan worked with Dr. Nancy Hendricks, director of ASU Alumni Communications, to recreate the moment from a half century ago. Hendricks tracked down many of the participants in the original photo, and invited other ladies of Phi Mu from the year 1959 to stand in for sorority sisters who were deceased or too ill to attend. Past Phi Mu president Judith Sanford Long, a 1961 A-State alumna, worked with Hendricks over the past six months, utilizing sorority records. Glenda Ball Lancaster of Poplar Bluff, Mo., and Florence Green Maxwell of Paragould, Ark., had posed for the original photo 50 years ago. Michael Nowlin of Jonesboro, an instructor of auto mechanics at the ASU Technical Center in Marked Tree, was instrumental in organizing the logistics of the event, including a local driving tour and securing the staging area at the ASU-Jonesboro Farm Complex prior to the parade to the Alumni Center. Arkansas State University is celebrating its 100th year anniversary this year with a number of special events. Swan said that he was honored to participate in the festivities in a very special way by exhibiting his 1922 Model T Ford Touring Car that he has owned since 1954. After graduating from high school in Marked Tree, Ark., he enrolled as a freshman at Arkansas State in the fall of 1958. Swan's only transportation at the time was his Model T Ford. Since he did not live on campus, he relied on the car to commute. Returning to his car after class one day, he discovered it surrounded by a number of Phi Mu sorority pledges. Swan later said he was sure he had "died and gone to Heaven." The ladies wanted to borrow his car as a prop for a sorority party which had a Roaring 20’s theme. As a reward, they invited him to the party. 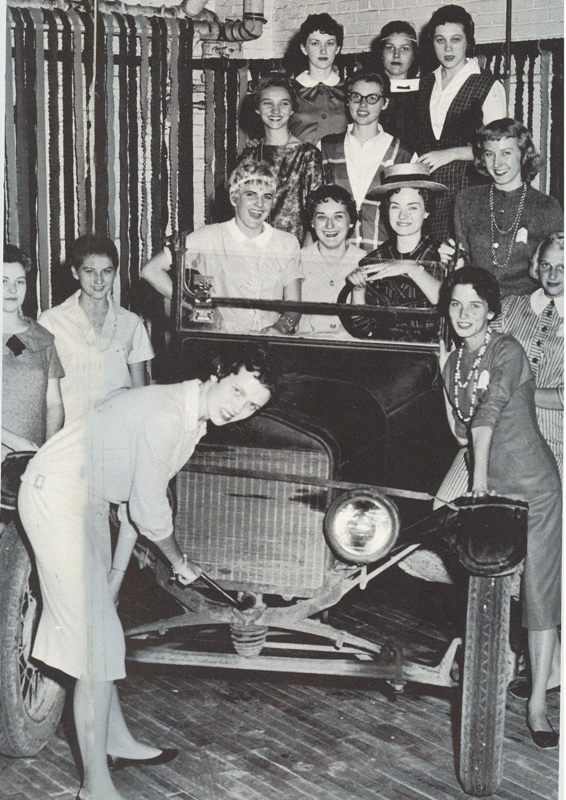 A campus reporter took a picture of the car surrounded by the young ladies, and the photo was featured prominently in the 1959 college yearbook. Learning of ASU's Centennial celebration this year, Swan contacted Hendricks to say he still owned the car, suggesting that the same group of ladies might pose once again, 50 years later, as part of the festivities. Swan and his wife Joyce drove the car to Jonesboro to meet with Hendricks in early June, where they shared some of the details of its ownership. The car, built in 1922, is still on the road in its ninth decade. Swan's brother had found the car in a chicken house in 1954 and bought it for $25. Swan says they added black paint, covered the seats in red plastic and improvised some wheels to drive it home. Since then he has completely restored it, and enjoys road trips with Joyce, who drove her own antique car to ASU for the Homecoming celebration. They suggested that many fellow Model T enthusiasts might wish to display their cars during Homecoming weekend to create the atmosphere of campus life in the ‘20s. Participants from the Arkansas Tin Lizzies, Arkansas Model T Ford Club, Tennessee T’s Model T Ford Club and others enjoyed a tour of the area on the perfect autumn day before rallying at the Alumni Center, where they later joined the pre-game tailgate party at the Alumni Center after the historic photo re-enactment. Swan said, "It was absolutely a blast from the past. It was phenomenal! I personally was mesmerized by how the ladies suddenly seemed to appreciate what was happening, especially when they realized they had not seen each other in a half century in some cases. I was totally blown away when the first lady to appear set the tone when she mentioned that she had not seen or heard from the other ladies in 50 years. That statement put it all into perspective for me." The event was free and open to the public, many of whom took numerous pictures, visited with the car owners and generally became caught up in the nostalgic spirit of the event. For more information, contact Dr. Nancy Hendricks, director of ASU alumni communications, at 870-972-2451 or e-mail nhendricks@astate.edu.